The National Alliance for Grieving Children conference brought together Dr. Heidi Horsley and Marcie Taylor, a bereaved parent who works in the field of grief and loss. Her son died four years ago when he was three years old. Taylor and her husband created the Drew Michael Taylor Foundation in Pennsylvania in memory of Drew. It’s a way to honor her child, serve fellow bereaved families, and empower others who have had a similar life situation. Grief is isolating and a very lonely feeling. Surrounding yourself with supportive people who “get it” is critical. It’s important, whether you get it through a grief center, family, friends, or any other avenue. Taylor encourages parents to move beyond their own grief. It takes a village to raise your child, and to raise your family while you’re grieving. Vocalize what you need people to do, because otherwise it’s a very lonely place to be. As the griever, you need to find the energy to reach out for the help. If you’ve lost hope, reach out to Taylor’s foundation or another center in your area. The Drew Michael Taylor Foundation has a strong social media and online presence. For Taylor, she found great healing in helping others, which is a common reaction for the bereaved. However, it’s important to work on healing yourself first before helping others heal. There’s a thin line between being ready to serve and jumping the gun. 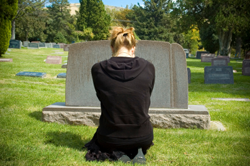 Being a bereaved parent is heartbreaking, but it’s not the end of the world. Honoring your child is a way to continue those bonds beyond death. A relationship doesn’t end when a life does. There are many ways to keep those memories alive.